A common misconception is that a graphic designer and a web designer are essentially the same thing. This is not the case. While there are some aspects of a graphic designer and a website designer that do cross over generally they are two different professions. Graphic designers design graphics! Most of their design work is for press related communication materials such as logos, brochures, stationery, letter heads, business cards; the items that get printed. Web designers mainly design for digital communication in the online space. They specialise in websites, email signatures, user interfaces, items that stay on screen. Both disciplines use similar tools in the initial creative phases, e.g. sketching, conceptualising, Adobe Illustrator and Adobe Photoshop & Sketch. Web designers often use the visuals that have been created by a graphic designer, for example a logo or banner graphics and style guide whit in user experience. Graphic designers should create logos in may different formats so they can be used across different mediums including the web. 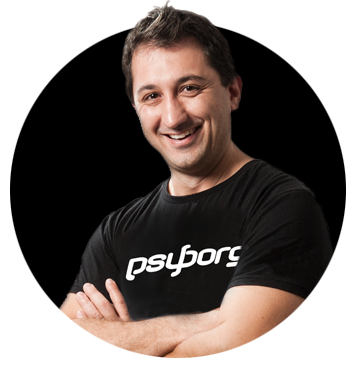 Read more about the formats psyborg® hands over to clients. When it comes to the execution the tools then separate. In print a graphic designer typically uses Adobe Indesign to execute press related designs. A web designer uses tools like Adobe Dreamweaver or Adobe Muse to execute various code languages (e.g. HTML, CSS, PHP & MySQL) and platforms like WordPress to implement content management websites. Graphic designers understand concepts such as layout, typography, the use of space, contrast, balance and colour. Web Designers need to understand how to express these elements visually through user interfaces and the limitations of programming and displays used. At psyborg® we do both. We understand how important branding and visual communication is for a business and therefore how we can integrate that brand offline and online using both graphic design and web design skills. So not only create a functional and impressive online presence for a business, but we can also provide all the print aspects as well. I believe being efficient in both graphic and web design helps with consistency across all mediums, as we know consistency is very valuable when building your brand. While both graphic design and web design do have similarities they are also unique professions. We cater for businesses looking for graphic designers and web designers in the Newcastle and Lake Macquarie region.